Microsoft on Thursday released a new scanning app for the iPhone, Office Lens, while Omni Group's OmniFocus 2 has become a universal title on iOS, eliminating the need for separate iPhone and iPad downloads of the professional task manager. Previously available only for Windows Phone or as a part of OneNote, Office Lens lets iPhone owners scan documents like business cards and receipts by taking a photo of them. These images are then automatically cropped and enhanced before being uploaded for viewing through OneNote or OneDrive, where character recognition makes the contents of images searchable by keyword. Business cards can be turned into contacts, and more elaborate documents can be converted into Word, PowerPoint, or PDF files. Scans can be shared with others via methods like email or iOS 8's share sheet. The app is a free download, and runs on any iPhone with iOS 8. Version 2.1 of the iPad app is now a universal title, not only adding iPhone support but bringing some features to that device that were missing in the separate iPhone release. These include Project Perspectives, landscape and Review modes, and grouping and sorting functions. Pro users in general have access to several new features, such as a Notification Center widget, a tiled home screen, and Perspective Creation on the iPhone. In universal form, the price of OmniFocus has gone up from $30 to $40. The Pro upgrade costs an additional $20, with the exception of people who bought OmniFocus 1 for iPhone or iPad, who get it for free. 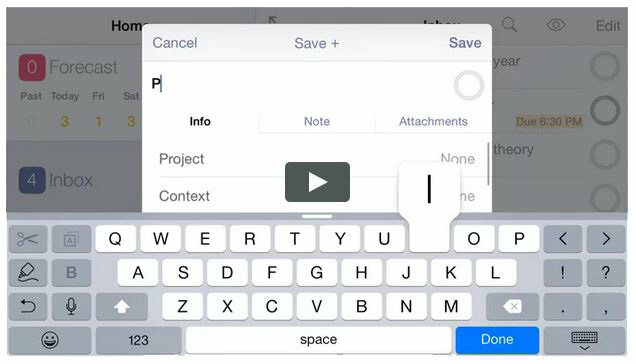 OmniFocus 2 users must have iOS 8.1 or higher.